These sensors are available in 2 different mounting styles for flat or curved surfaces. The integral thermocouple sensor is bonded onto the inner surface of the self adhesive aluminium foil strip, which is provided for faster response times. 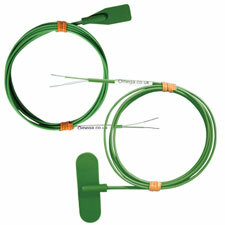 Type K, 15 x 50 mm curved surface sensor, 1 m lead wire with mini plug.